Located in a beautiful coconut grove with an infinity pool right on the unspoilt white sandy beach . 3 luxurious double bedrooms , many excellent sandy beaches ,restaurants nearby . 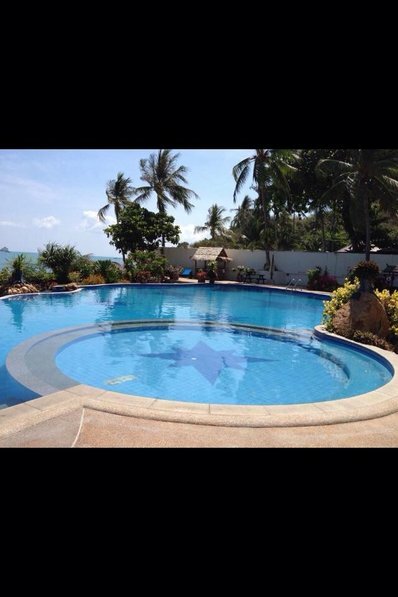 Luxury villa ,walking distance to the beach, where a stunning infinity pool overlooking the beautiful white sandy beach is available for your use .Amazing views of Koh Phangan island . The property is fully managed by a very helpful company who is very local. The villa enjoys full internet and wifi.There is Full Air Conditioning in every room . The charming fisherman’s village of Bhoput, is 10 minutes away and offers wonderful views over the beach and bay .The villa has 3 air conditioned bedrooms. The large master bedroom has a luxury en suite bathroom .Also a further 2 bedrooms ,each with two large single beds . these can be put together to form a double bed if requested .The villa has large open plan living and dining area with beautiful furnishings , along with a contemporary , fully equipped kitchen with granite worktops . The villa come comes equipped with plasma TVs and DVD Players. Tastefully decorated the villa is cleaned throughout with bedding.sheets and towels changed weekly . The walk to the beach involves a hill . The tropical white sandy beach 500m from the villa merges effortlessly into the coconut plantation where you can watch the waves gently lap ashore whilst relaxing in the infinity pool and jacuzzi. A stones throw away, sample a thai meal in the simple rustic beach robinson crusoe hut , or just enjoy a lazy day on one of the sunbeds around the pool . Explore the exciting nightlife in neighbouring Chaweng or Bophut both a 10 minute drive away.. 2minutes away is Chong Mon with many bars and restaurants to choose from,or chill out at one of the many beach bars open until late, enjoy a cool drink coupled with a warm sea breeze. When this gets too much, choose from one of the many beachside masseures or reflexologists. For approximately £6, you can be pampered for an hour a day with the treatment of your choice.Very necessary after all the shopping Chaweng has to offer! !